Maybe you’ll make a note for your kid’s lunchbox, and it’ll bring a smile to her face. Perhaps you’ll take a step toward mending a habit you’d like to repair. Or maybe you’ll tell about a project that’s making a difference in your community. Who knows? You might even make a craft project out of an item that needs mending. Regardless, share a story about changing life for the better. Sure, the graphic says “mend you, make stuff,” but you can interpret the theme however you want. By all means, be liberal with your interpretation. Post a photo, write a poem, dream up a fiction piece, or write a straightforward post. Whatever you do, don’t worry about perfection. Just take part in the conversation. Then, every Wednesday during February, I’ll write a round-up featuring some of your (sure-to-be inspiring) posts. Get into the spirit of encouraging others, taking care of yourself, and making stuff. Anytime in February, write a post on the theme. When your post is ready, go to the Mend, Make, Change Link-Up Page add your entry. Then, read at least two posts from your fellow party contributors. Pick your fave post from a fellow party-goer, then share it generously on your social media of choice. Check back here on Wednesdays in February. I’ll write a round-up of the stories submitted that week. Use original content throughout your post. I know you know this. The point is dialogue, so don’t link to giveaways or anything you’re selling. Okay, that may be a slight exaggeration. Who knows what kind of romance is happening on white boards throughout the Minneapolis – St. Paul metro? Either way, the one at our place has to be up there, as far as dry-erase relationships go. It started as a simple craft project, another of my attempts to surround myself with pretty things (a little less ugly, at least). Going through a discarded box, my man dug up an old white board. “How about we hang this in the kitchen?” he asked. I liked the idea, but the crafty part of my soul died just a little. White boards are practical and all, but, what can I say? Aesthetics matter to an artsy type like me. Speaking of which, you’ll have to excuse me for breaking one of my self-imposed blog rules. No care was taken to ensure quality lighting or good composition in a single photo here. Oh well, sometimes you just have to live with it. These are just two regular picture frames. For the dry erase, I put fabric where the poster would go. This process is easy peasy, and I highly recommend doing this yourself! 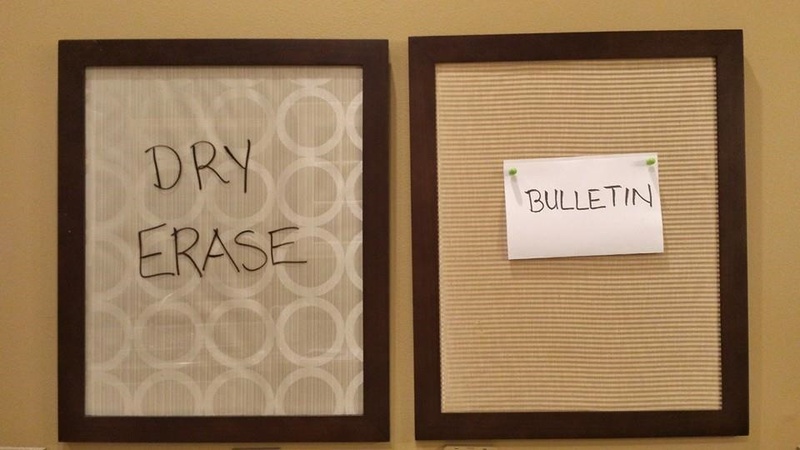 It’s a great way to transform a dull whiteboard into cute custom wall art! Unfortunately the bulletin board turned out to be way more work. I added foam core, lined it with fabric, and removed the glass. Getting the thickness just right took tons of trial and error, as the foam core wasn’t designed to fit inside the frame. If you try this yourself, I recommend getting foam core of various thicknesses, then seeing which works best. What happened next was a bit of a surprise. The white fabric-lined gold board became a vehicle for sweetness. If you’re anything like me, exotic gestures aren’t your kind of romance. Instead, it’s everyday thoughtfulness that makes your heart flutter. Our silly conversations, along with diagrams and drawings (of course), are what I enjoy about the board. August 30, 2014. He’d just returned from a trip. Note how he changed my writing to a goofy non-word. Sept. 9, 2014. The super moon WAS super cool. March 4, 2014. A day I shoveled the driveway. I once took a personality test that revealed my greatest fear is being without orientation in life. Can you see how my man’s guiding tendencies are a good match for me? Also, who else thinks maybe I ought to make more of an effort to help out around the house? Evidently he’d appreciate it. Here’s how the mail game works, by the way: Whoever gets the most junk mail, has to put it all in the recycling bin. Sure, the bulletin board isn’t nearly as fun. It’s kind of hideous, actually, covered in coupons and who knows what. Still, it’s the little things that make me smile. Some fabric and a small bit of effort, ended up creating one of my favorite items in the house. What about you? What’s something in your home that brings unexpected joy? 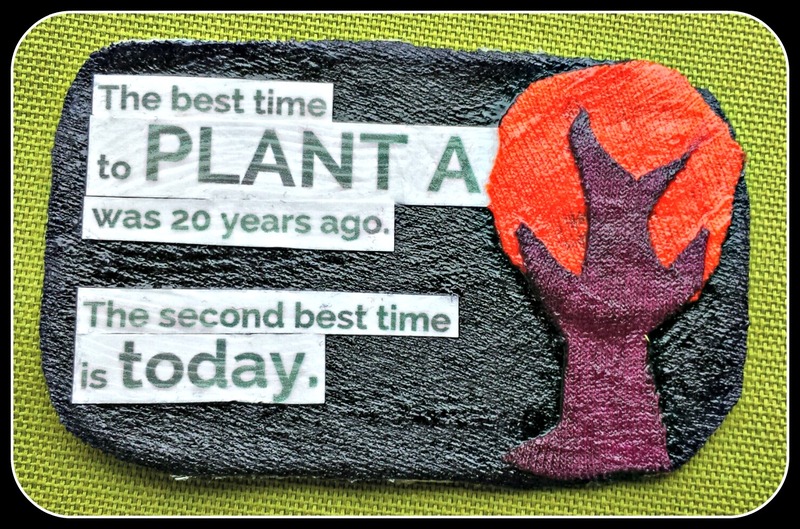 What “trees” are you planting these days? I’d love to hear about your hopes and projects.